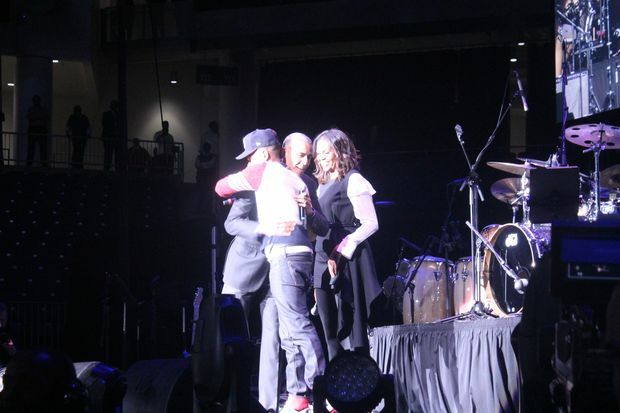 Barack Obama And Chance the Rapper embrace on stage with Michelle Obama at the Obama Foundation Summit. SOUTH LOOP — An all-star lineup of diverse talent, including soulstress Andra Day, Gloria Estefan, Aziz Ansari, Brandi Carlile and Chance the Rapper closed out the Obama Foundation Summit Wednesday evening. Organizers had billed the concert, like the summit, as a community event to inspire active citizenship. "There's been a lot of amazing, brilliant people working in this city to make this city and the world a better place, but they just need a boost. They need the boost to get there and that's what the Obama Summit is," said Chance The Rapper, who hosted the event. Around 8:30 p.m., the lights dimmed in the new Wintrust Arena at 200 E. Cermak Road near McCormick Place, as Andra Day took the stage singing her inspirational single "Rise Up." After Day's exit, Chance took the stage and introduced the former first lady, a Chicago native. "It's just so good to be home," said Michelle Obama. "For Barack and I, bringing this foundation home is important to us... It's the city that raised me. It's the city that connected me to the love of my life." She continued by referencing her surprise visit to Hyde Park Academy High School with Prince Harry Tuesday afternoon. During the visit, a young man asked why the Obama Foundation had chosen the South Side for its headquarters, she said. The young man apparently was in the crowd, and upon hearing a reference from Michelle Obama screamed "that's me" to applause from his classmates. "That's you," she quipped, before continuing "The question isn't why would we be here on the South Side of Chicago, but why not?" The former first lady introduced her husband, who was welcomed to the stage with a loving embrace from Chance and shouts of "We love you!" "You all brought her into my life — a girl from the South Side," Barack Obama said, pausing before repeating "South Side!" like a true South Sider. "Oh, we've got some West Siders in here," Obama said with a chuckle. The summit is the first major event articulating Obama’s post-presidential mission to promote civic responsibility and get young people engaged in building more equitable and inclusive communities. While 300 people were invited to the summit, about 450 people from around the world attended the gathering for young leaders, he said. "The goal of the foundation is to train the next generation of leaders," he said. "So they have a circle around them. They have a network." Cuban-American singer and actress Gloria Estefan followed the Obamas running through a few of her hits including "Conga." Between sets, attendees were treated to videotaped messages from leaders involved in the summit, including Jahmal Cole of My Block My Hood My City and Rihanna. Comedian Aziz Ansari and his writing collaborator Lena Waithe bickered on stage for several minutes about their hometowns. Waithe, who won an Emmy for Outstanding Writing for a Comedy Series for her work on "Master of None," described herself as "a proud daughter of this city." "I'm so proud to be from this city — from Harold's to the roller rink," said the South Sider. "Everywhere I go 'the Chi' comes with me." The comedians were followed by Brooklyn rap legend Nas, who performed "If I Ruled The World," "I Can" and "The World Is Yours." Grammy-nominated folk rocker Brandi Carlile and Cincinnati indie rock group The National took the stage in separate sets before Chance — aka Lil Chano From 79th — got his hometown on their feet. "Chicago has always changed history," Chance said, acknowledging slain revolutionary Fred Hampton, who was killed at the age of 21 during a raid by the Chicago Police Department. He started his set with an untitled track that he debuted in September on "The Late Show With Stephen Colbert," which he reportedly wrote 48 hours before performing. After performing "Summer Friends," he introduced some surprise guests: Francis and The Lights, who performed "May I Have This Dance," and "Hamilton" creator Lin-Manuel Miranda. Chance took the crowd to church with his hit "Blessings" before a defiant finale performance of "No Problems." The song highlights the reason the young performer has decided to remain an independent artist, and the accompanying visuals Wednesday night made it clear he hasn't changed his mind. The visuals featured satirical logos of Sony as Phony and Warner Music Group as Wiener Music Group. Barack Obama at the Obama Foundation Concert. Plus, Michelle Obama. Plus, Chance the Rapper.